According to a recent survey published by RightScale Inc., more than 90 percent of businesses use some form of cloud technology. The benefits of using the cloud are clearly undeniable, but that doesn’t mean getting set up and running on the proper solution for your organization is effortless. Despite its overwhelming adoption in the business world today, the cloud is still characterized as new technology and as such, it presents a number of concerns that must be addressed to maximize utilization and help ensure meeting data privacy criteria that are compliant with all industry standards. After all, your organization is liable for protecting customer information no matter how you choose to store and access the data. 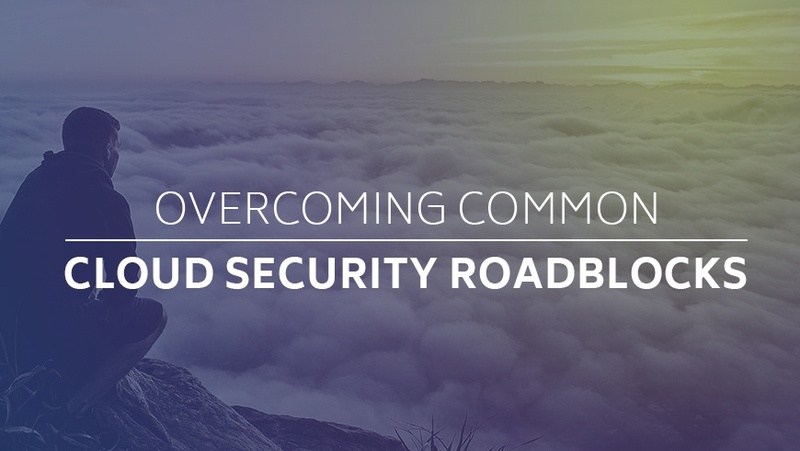 Here are some of the most common cloud security roadblocks and how to overcome them. It’s easy to get caught up in the service details and the potential they bring to your organization’s operation, but lapsing on security could be a devastating mistake. Cloud service means your confidential data will be stored in another location. And that’s going to require specialized security measures that deserve equal if not greater focus than service alone. Develop a cloud security strategy as part of your transition to the cloud (meaning at ground level—not after you’ve already adopted a cloud provider). Building your foundation with a security strategy in place will ensure your organization takes a security-first approach to the investment. This allows you to enter into new technology in a proactive state instead of a reactionary state, which can result in costly, stressful efforts to resolve security issues. There aren’t many threat detection systems that offer an all-in-one solution. In most instances, business owners need multiple systems in place to properly identify data threats. The same goes for most defense systems. Cloud security lacks an all-encompassing solution. To solve the issue with threat detection systems, invest in a process/system integration tool that centralizes all inputs into a single, organized, real-time chronicle. Make sure this integration tool organizes information in a way that’s easily accessible and understandable to all parties who require access to it. To address overall defense systems, business owners need a management system that seamlessly integrates all areas of their cloud security. Regardless of whether cloud service is private, public or on-premise, most organizations struggle when trying to integrate their cloud security with DevOp tools and other business systems. When these components don’t properly align, inefficiencies can impact utilization and the protection of data. Simplify complex deployments, automate as many manual processes as possible, and identify and resolve operational congestion. Your cloud security posture must be flexible, and a scalable cloud integration platform will also help support integration across data environments. As we mentioned earlier, the cloud is still a developing technology, which means many of the solutions available for cloud users are generic, with standardized tools like audit trails, access controls and intrusion detection that weren’t developed at inception with a clear vision for purpose. This simply isn’t efficient enough to keep pace with today’s quickly evolving cybersecurity landscape. Seek customized solutions instead of generic ones. Ensure they were built specifically and exclusively for the cloud, and capable of scaling up or down to meet the ever-changing demands of your business. While anytime access to information is a major step up in your organization's competitive game, the ultimate focus must still be on protecting your business data and the privacy of your customers. Even with cybersecurity attacks making headlines on a near-weekly basis, many organizations forget to put cloud security first or worse, don’t know where to start. Automate your data correlation process and shift the attention from detecting security issues to resolving them. Those who successfully automate tasks like this reduce their risk of human error and gain greater insight into the security issues that threaten their cloud infrastructure. Bottom line: Organizations need to zoom out and concentrate on the big picture. By developing a customized security strategy early on, your organization can invest more wisely in specific solutions that fit its entire infrastructure instead of piecing together single-point solutions and hoping the stitching holds. Jason Rhoades is a Principal at Schellman & Company. Jason is a SOC practice leader and assists with methodology and service delivery across all service lines including SOC, PCI-DSS, ISO, FISMA and HIPAA services. Jason also helps assist large and complex customers who have multiple compliances needs helping them strategically align their efforts to maximize cost and efficiencies. Prior to joining Schellman, Jason served as a project manager with a Fortune 500 company where he was responsible for design, implementation and security of critical applications supporting various business functions.